Clavering is a large, suburban village, big enough to have a supermarket. Celebrity chef Jamie Oliver grew up in the Cricketers, the village pub his parents kept. Off of the high street is the old village centre, a winding lane with 15th and 16th century houses that ends at the churchyard. A huge, perpendicular castellated church shoe-horned into a little churchyard, like a bullock in a ballet costume. 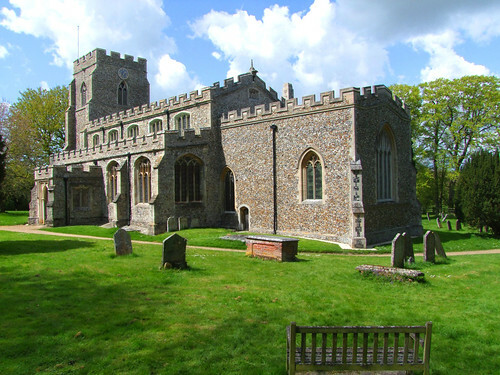 The church would be quite at home in south-west Suffolk with its aisles and clerestory and great bulky tower. Now, I hadn't really known what to expect, but this is a splendid church, full of interest of every kind. It has one of the largest collections of medieval glass anywhere in Essex, a fine rood screen, excellent 17th and 18th century memorials and much else besides. I don't know how Simon Jenkins can have missed it. Let's face it, Essex is hardly over-burdened with the kind of spectacular churches you get in Suffolk and Norfolk, but this one is crying out for attention. It certainly went into my Essex top 10. A real find.